Photo credit: THOR, Flickr, used with permission under Creative Commons license. It is no longer a stigma of prison inmates, sailors or bikers. Your health care provider may even have one! Whether it’s for personal expression or group affiliation, seems more and more people are getting a tattoo, from celebrities to the “average Joe.” One poll shows that 21% of Americans are inked. Regardless of its newfound popularity, it’s not a good idea to jump in without much thought. After all, it is painful and permanent. There are laser treatments to remove it, but it never removes it completely. Plus, it is costly and time-consuming, requiring many visits. So let’s weigh all the options beforehand. There have always been inherent risks with going under the needle. Even with sterile instruments and proper aftercare, you never know how your body may respond. Some of the health risks include bleeding, tears, infections, allergic or inflammatory reaction, and activation of a native disease such as lupus. There are other inflammatory reactions with long names like a psuedolymphomatous reaction or psuedoepitheliomatous hyperplasia. Roughly 2% of tattoos result in clinical complications. Make sure the parlor is licensed if the state licenses them, and that your artist is experienced. Make sure the tattoo parlor is clean. Observe the artist’s techniques in sterilizing non-disposable equipment. Make sure the artist uses new ink for every client. Make sure the artist opens the wrapped needle in front of you, and if possible, choose a parlor that uses disposable kits. Make sure the artist wears sterile gloves. Make sure that the inks used are made of nonmetallic organic pigments, and are manufactured by larger companies, as this can decrease the likelihood of getting contaminated ink. Do not get your tattoo while intoxicated. 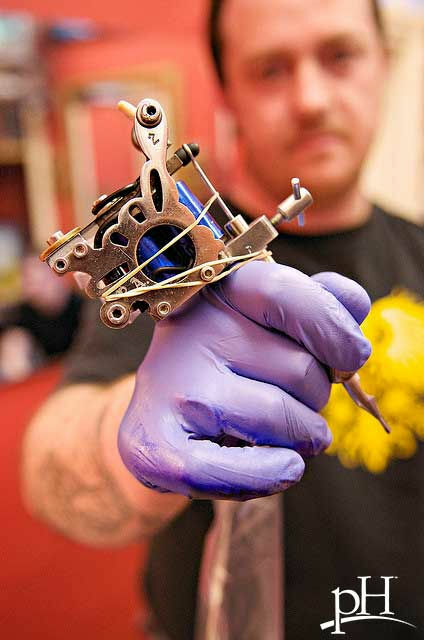 Take care of your tattoo, as it is an open wound and can get infected in the first two weeks. Consult your health care provider if you develop redness, a rash or discharge. Just as important as knowing the health risks of your new tattoo is considering your mindset, as well. A recent study published in the American Society for Clinical Pathology showed that people with tattoos seem to die earlier than those without. That isn’t to say the tattoos themselves were to blame, but people with tattoos were more likely to engage in risky behavior, like drug or alcohol use. This may be because of the mindset some people with tattoos have -- to “live for today,” without considering long-term consequences of personal decisions. So when considering a tattoo, be sure you’re making a smart long-term decision, and consider your overall lifestyle. As tattoos grow in popularity, people from all walks of life are getting inked. Some do it to express themselves, others do so in memory of a loved one, and others identify military status. Whatever your reason, don’t forget to think of your health, physically and mentally. Be proactive! Enjoy Your Healthy Life!